Saving money on your utilities is one of the best ways to create a situation in which you add up money over time. This can be very important if you want to build a successful financial future. While it doesn’t seem like a lot of money to save each month, the reality is that these regular savings add up and can quite significant when you think of saving over the course of decades. Only wash full loads with your dishwasher and laundry washer. A partial load can use the same amount of water, but you will be washing more often. Do what you can to fill full loads so that the whole process is that much more efficient. If replacing a dishwasher or washing machine, replace it with a high efficiency model. It doesn’t cost that much more, really, and any extra cost is usually recovered in your savings over time. Use a low-flow shower head. This can easily cut the water used during a shower in half. While you’re at it, stop taking such long showers, and avoid baths. It really shouldn’t take you more than 7 or 8 minutes to accomplish what you need to in a shower. If everyone in your family used a low-flow shower head and reduce shower times, you could save a lot in terms of water use. Replace the aerators on your kitchen and bathroom sink faucets. This is the part that screws onto the end of the faucet and controls the flow of water. Make sure that they are working properly, and adjust them so that the flow is lower. Turn off the water when not in use while brushing your teeth or shaving. There is no reason to leave the water running when you aren’t really using it. Another good trick is to keep a watering can for plants under your sink. While you wait for the water to heat up, add it to the watering can. You’ll send less down the drain. Replace your toilet with a low-flow model, or install a tank bag or adjustable flapper, which reduces how much water is needed to fill the tank. Often, you really don’t need that much to effectively flush your toilet. Use a rain barrels attached to your eavestrough downspout to collect water. This can then be used for watering plants or washing your car. That way, you aren’t using potable water for these tasks, and nothing saves on the water bill like using what nature provides for free. Water your lawn at night or early in the morning. This allows the water to sink into the ground without evaporating in the mid-day heat. Also, avoid over-watering. Many home owners water more than they need to. Find out how much water your lawn actually needs, and plan your schedule accordingly. If you have a sprinkler system, setting it up on a timer can ensure that the water comes on when it should, and that it doesn’t stay on too long. This can be a great way to avoid wasting water on your yard. Even better is if you can plan your landscaping with drought-resistant plants and native plants. These will need less water. Keep water in the fridge to have cold water available without running the tap until it cools. You can also use the watering can trick for cold water. Check for leaky faucets or toilets and get them repaired. These leaks can waste thousands of litres of water in a year. Think about if your faucet is dripping a drop every second. That adds up pretty fast, and all of that water is just going uselessly down the sink. Also, check for leaks in other areas, and keep on top of the pipe situation. 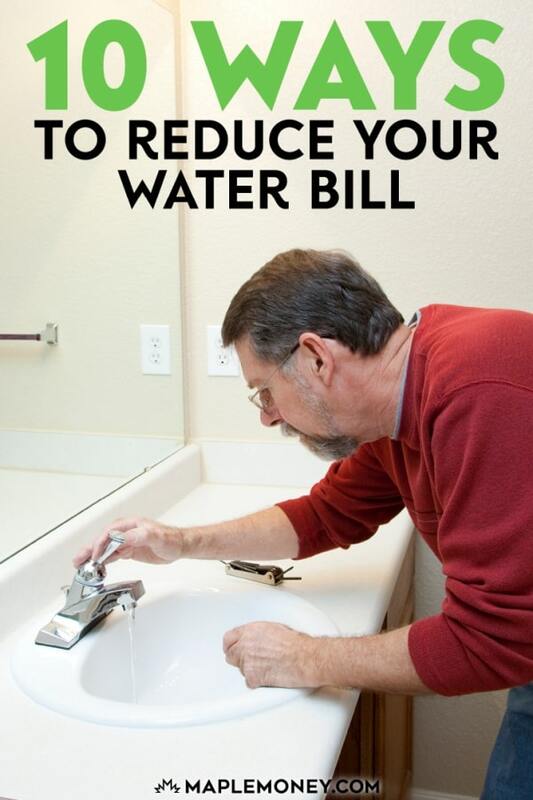 A broken pipe can mean even more water waste and bigger bills. Why Are You Wasting Money On Bottled Water? While you might be looking to pay less for your water bill, one time it’s really worth running the tap is for an alternative to bottled water. For some, bottled water seems to be associated to economic class. The misconception implies that the rich sip the refined bottled water while the poor settle on tap water. Bottled water drinkers have all been fooled into spending their money on a product whose reputation has mostly been built on smoke and mirrors. It is true that some bottled water does come from natural springs, but more often than not consumers are buying bottled municipal water at an outrageously inflated price. In fact, bottled water is most often glorified tap water drawn from pipe mains in cities where water safety is not a concern. Sure, the bottled water may be filtered, dechlorinated and further purified, but then so is tap water. In Canada, tap water is subject to strict regulations, vigorous testing and treatment to ensure public health. One must also account for the fact that the cost of a commodity like bottled water is not limited to the overpriced liquid. The expenditures associated with producing the container, packaging the water, transporting and distributing the finished product, as well as disposing of the empty bottles – not to mention the environmental impact of the entire industry – should be enough to convince anyone to stick to drinking tap water. So why not avoid the ongoing cost of replenishing your stock of bottled water by investing in a quality reusable container and filling it with tap water? It makes so much more financial sense. 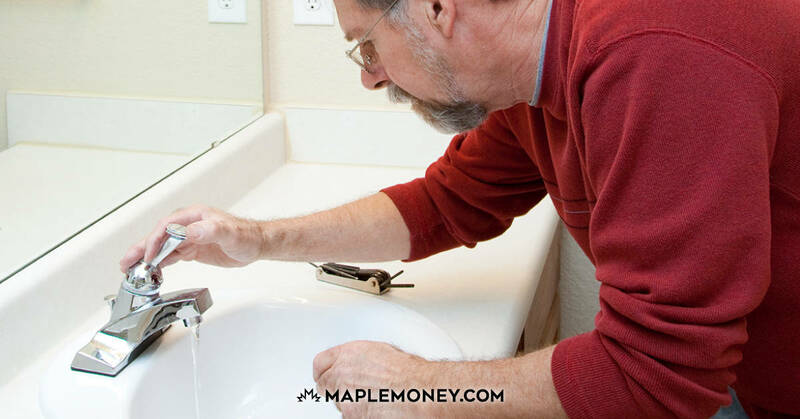 With a very little effort, you can adjust your habits so that you aren’t using as much water, and you can get in the practice of checking for leaks every few months. Combine your water efforts with attempts to reduce your power and heating bills, and you’ll see even bigger savings. That’s great. I never thought of watering my lawn at night. Good tips! In Australia, we often have to live with drought so most of us have become pretty ‘water-wise’ and many of us still live this way even after our “summer of sorrow” when we were hit with massive floods. But one way that many of us use to save water is to keep a ‘watering bucket’ in the shower so that the hot water running when we first turn on the shower is collected in the bucket and used to water our pot-plants. I drink bottled water since Ottawa has the worst tasting water of any Canadian city I’ve ever lived in. For the record, I have lived in 3 provinces and several cities including Montreal, Toronto, London, New Castle, etc. I never would have thought of purchasing water until I moved here…most days if I drink brita filtered tap water… I boil and end up drinking tea to mask the horrid smell and taste of downtown Ottawa drinking water. Not sure why it’s so foul. Have you considered a proper water filtration system? A good countertop/undersink system filters out nasty tastes and odours as well as a host of other contaminants. The Britta jugs do an ok job at filtering some of the smells/tastes however the jugs can attract bacteria growth. Boiling is also not the best option as some contaminants, such as metals and fluoride, actually become concentrated, becoming potentially dangerous. Your best bet is to grab a proper water filter system. It will give you better water while saving you a pretty penny! The water from the Detroit municipal system is consistently rated among the highest in the country, so we drink from the tap all the time. Even at work, I have a bottle that I fill up from the tap and stick in the fridge, then pour into my cup when it’s cold. We buy bottled water just to have at parties when we have people over. That’s pretty much it. If people are concerned about drinking water in any major Canadian city, including Ottawa, they should install a filtration system or buy a filtered pitcher.It doesn’t make sense to buy water where it flows freely and safely. I can buy a litre of gas for the cost of a bottle of water. I live just outside town limits, so I have my own private well. The water is absolutely delicious, and I don’t even have a pesky water bill to pay. We Loved our tap water then had to move. I drink from a gallon of bottle water mixed with tap water in a glass until I am used to the new taste! I loved next to 2 bottled water plants drawing from the same source with different name. Only one was in the actual place mentioned on the bottles, HA! The water in our state is also considered safe, and we don’t have any problems with drinking tap water all the time. It saves us money and at the same time helps reduce our footprint. In Nova Scotia, Efficiency NS (admittedly paid for by NS Power customers) will come and do a lot of the retrofits for free. They changed my shower head, my tap aerators, and insulated my water pipes, not to mention switched out my incandescent light bulbs. One more bit of advice is to use an instant hot water heater in key places. This will prevent you from running the hot water until it’s hot. Depending on the house, and location of the water heater, that can take a while. I love how the eighth tip has multiple benefits. Doing that also keeps your lawn from getting burned as well. It’s awesome how it only takes simple tasks to save water. Another alternative to all of these suggestions is to have a water bore. I’ve heard that can also be helpful. This may be a silly question but here goes. If I still use the same amount of water but I don’t put down drain for sewers will it lower my sewer usage. Thanks.